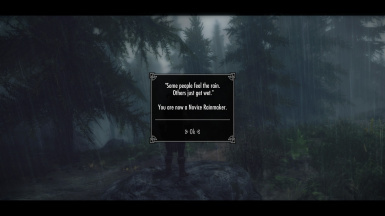 Rainmaker offers an immersive way to make it rain, for the sake of Pluviophiles in Skyrim. You will also gain several perks which makes you brisk and comfortable in the rain as you progress as a Rainmaker. Fixed: Removed unnecessary master. Updating is not necessary unless you don't have Dragonborn DLC. 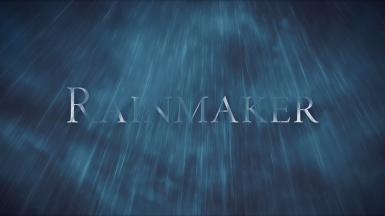 You are a Rainmaker. You can make it rain by praying. You will also gain Rainmaker perks as you progress as a Rainmaker. To get started, go outside and use Pray for Rain power. Wait until it starts to rain. The rain will get heavier as you continue praying. You will become a Novice Rainmaker when you finish praying (move or jump to finish). You will gain your first Rainmaker perk out of three basic perks. You will gain more perks and reach higher ranks as you make it rain repeatedly. The higher your Rainmaker rank, the more powerful effects of Rainmaker perks are. Your Magicka is increased and regenerates faster while it is raining. 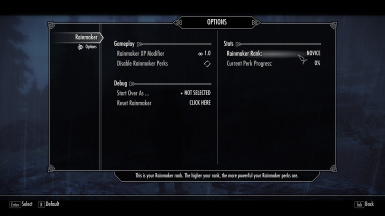 Your restoration spells are more powerful and cost less Magicka while it is raining. Your illusion spells are more powerful and cost less Magicka while it is raining. Your Destruction Shock spells are more powerful and cost less Magicka while it is raining. 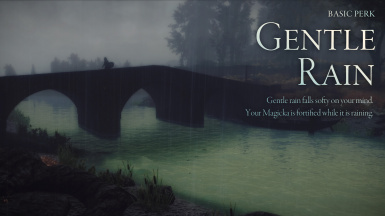 Your Magicka regenerates much faster while it is raining. 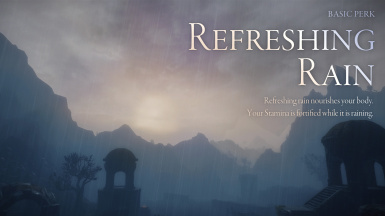 Your Stamina is increased and regenerates faster while it is raining. Your critical hit chance is increased while it is raining. Your Fire Resistance and Poison Resistance are greatly increased while it is raining. You swing weapons faster while it is raining. You move faster while it is raining. You can shout more often while it is raining. You move quietly in the rain. You can harvest more ingredients in the wild while it is raining. You can gain brief invisibility at will while it is raining. Rainmaker perks work indoors as if you were outdoors. But their effects are much weaker than when you are in the real rain. The weather you changed by Pray for Rain will not change. 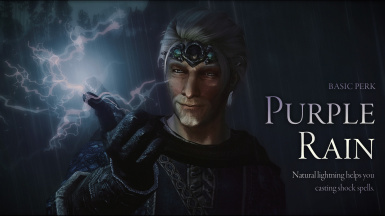 Use Never Ending Rain power to toggle. You can turn snow into rain. You learn skills faster while it is raining. 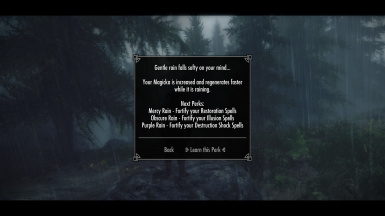 Rainmaker does not modify weather itself so it should be compatible with any other weather mods. 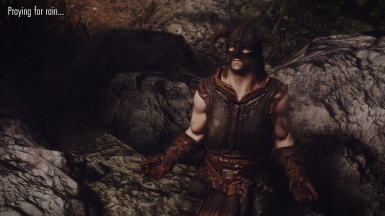 Basically, you should not uninstall any mod mid-playthrough. I recommend to reset Rainmaker from MCM instead. Then Rainmaker won't affect your playthrough at all until you use Pray for Rain again. If you need to uninstall anyway, reset from MCM likewise before uninstalling. 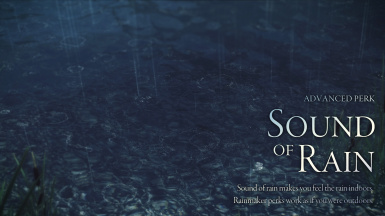 True Storms for better rain visual and sound. It also adds interior rain sound. Supreme Storms for harsher rainstorms. Compatible with True Storms. Wonders of Weather for splash of rain effect and rainbow (and interior rain sound if you don't have True Storms). 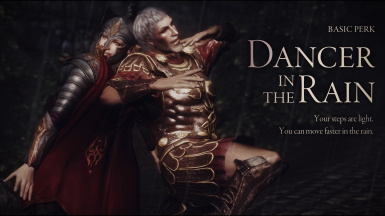 If you found the splash effects too bright for your enb setting, try to tweak opacity of dropsplash.dds. DOWNPOUR for better rain texture. 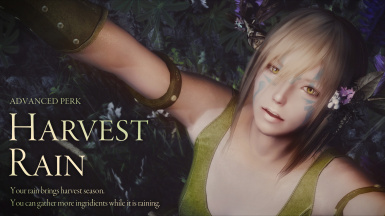 If you found the rain too subtle for your enb setting, try to tweak opacity of fxraindrops.dds. Frostfall for challenging gameplay. You will lose temperature in exchange for Rainmaker buffs from rain. Q: How can I progress as a Rainmaker? 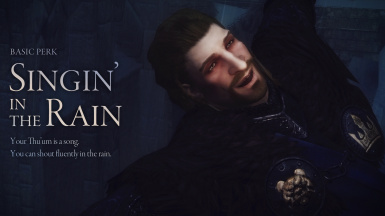 A: Make it rain. To be precise, once a day, you can gain full Rainmaker experience point when you use "Pray for Rain" no matter whether it was already raining or not. Apart from that, you can gain halved experience point whenever you make non-raining weather into raining. Q: It takes so long time to make it rain. A: Rainmaker doesn't force the weather to change but let it change in usual transition pace. It usually takes 15 - 30 sec. It takes more if the weather was already in transition to non-raining weather when you start praying. Some weather mod may change transition duration. 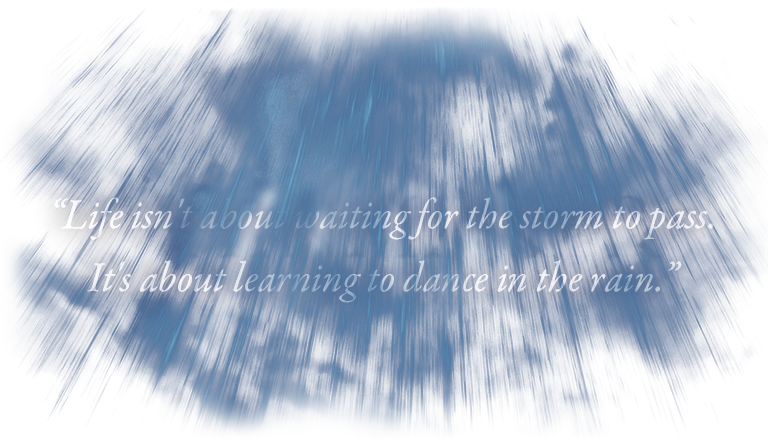 Q: My rain stops too soon. A: It occasionally happens. Kyne doesn't desire rain today. Q. Rain is fine. But I don't want any fancy buffs from the rain. A. You can disable Rainmaker's perk system from MCM.